Every so often someone writes and asks "Hey Rick, what's the best knife to buy and use for in the field?" 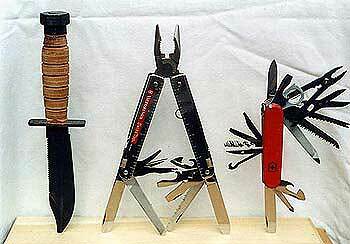 Well these knives here in the photo are the only knives that I own and have been using for a long, long time. 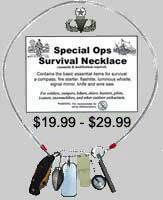 Along with my modified, shortened, double bladed machete and the same knives that I sell with all my SOS Survival Kits. Check'em out. And nope, I ain't one of those damn knife freaks who carry more than one knife to the field, just one knife is enough for me. And when I do head out into the boonies I usually prefer to carry with me my trusty ol'USAF Pilot / Aircrew Survival Knife. And when I'm home or traveling on the road I like to wear on my belt my Victorinox Swiss Tool. And when I go picnicking with my wife, family & friends I like to take with me my Swiss "Champ" Pocket Knife because I'll need the "cork screw" on it to open up my Italian bottle of Bardolino wine. So what's the best knife to own and use for the field? Hell, I'm not gonna say because there are too many damn knife freaks & sickos from www.knifeforum.com who will jump on me and disagree. And so I'll just say this... "it depends on how much you can afford to pay and lose should you break it, lose it or someone steals it from you." 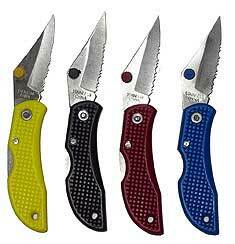 And all three of these well known knife brands above cost only between $30-$50 each, need I say more? And you know those knives that come with some parachute cord wrapped around the handles? Have you ever wondered how much more you pay for them just because they come with the paracord? Or the purpose of the paracord wrapped around a handle? The answer to the first question is... whether the 550 parachute cord comes wrapped or unwrapped around the knife handle, you'll probably pay between 10- 20% more for it." The answer to the second question... so you can grasp and hold onto the knife handle more securely. 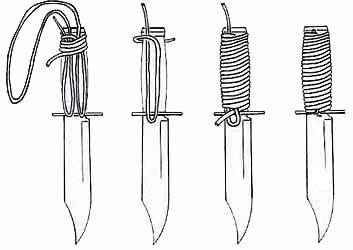 And should you find yourself in a life or death survival situation you can use the parachute cord to make a shelter, fire bow, some traps & snares, a bow & arrow and many other field crafts things. Now there's two ways you can wrap some parachute cord around a knife handle, with or without a lanyard. But before you can begin wrapping it youl need to do several things. (a) Burn/melt both ends of the parachute cord so the outer sleeve and the inner nylon strands don't come out and unravel. (b) Soak it in some water for about 15 (+/-) minutes so it will stretch while it is being tightly wrapped around the handle. And then when it starts to dry it will shrink nice and tight around the handle and not come off. If your knife came with a leather and not a plastic sheath with a snap-on button straps. 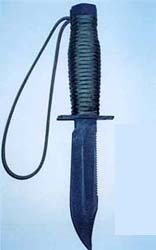 You'll need to soak the knife sheath in some water too for about an hour so the leather strap will stretch over and around your knife handle that is now much thicker becaue of the added parachute cord wrapped around it. KNIFE SHEATH TIP: Now if there's one thing that I don't like about some survival knives is the sheaths that come with them. 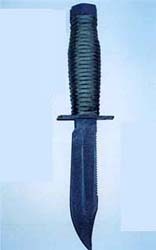 To attach some sheaths to your belt, either a military web or a civilian leather belt, you have to slide it thru some belt loops. Man, what a pain in the @ss and hassel. So what I did is take one of those web belt "alice clips" and place it on top of the belt loop and then I made two holes in the sheath so I could slide through these two holes the alice clip and presto. 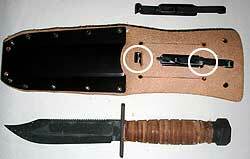 And so now I can attach and detach my knife & sheath to and from my military or civilian belt much easier. Cool huh? Check it out. Got A Question About Knives? No problem, just ask my knife master buddy "Chris" Bowles and he'll be happy to try to help ya out. Contact him at: bowlesknives@hotmail.com.